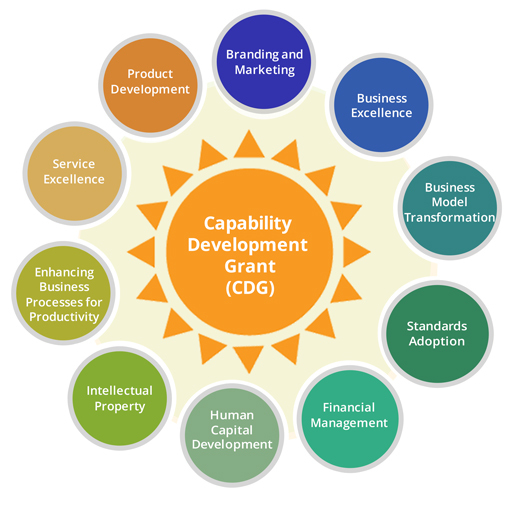 The Capability Development Grant (CDG) aims to support SMEs to scale up business capabilities and ensure business sustainability . You can take on projects in areas like product development, human capital development, business processes enhancements for productivity and business model transformation. The grant defrays up to 70 percent* of qualifying project costs such as consultancy, training, certification and equipment costs. The application requirements for smaller scale projects, for grant support of S$30,000 or less has also been simplified. You can look forward to more streamlined application forms and documentation requirements. improved productivity, enhanced job scope, wage increment etc. The JR Rider can be used to increase the level of funding support to a maximum of 80% of the qualifying project cost, or up to $20,000 payable per older worker who have benefited (whichever is lower), subject to the applicable caps to the JR Rider scheme. For more information about WorkPro and the Job Redesign (Rider), please visit www.wda.gov.sg/workpro. SPRING Singapore and AiF Projekt GmbH have launched the Germany-Singapore SME Funding Programme to encourage partnerships between German and Singaporean SMEs. The Programme provides funding for joint R&D projects between German and Singaporean SMEs from their respective governments. Interested SMEs may download the Briefing Pack ( , 114KB), Application Form ( , 181KB), and Brochure ( , 403KB) for more information.